SJ Fisher Construction can update your kitchen with the latest in contemporary or traditional design. 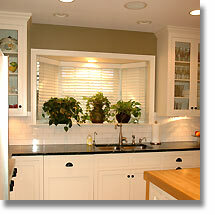 We work with a reputable kitchen designer at no additional cost to you. Together we can help you create the kitchen of your dreams. This home in the Interlachen area has a cottage flavor and the kitchen remodel is reflective of the house design. With square, recessed “Shaker style” cabinets and cupped black iron handles, the white kitchen with a splash of black creates a clean updated look while still coordinating with the original design of the home. This appealing complete main floor remodel features an entire new kitchen area with maple cabinets and granite countertops, a study work area, updated fireplace front complete with built-ins on each side, an updated bathroom and all new windows. SJ Fisher Construction, Inc., Minneapolis, St. Paul, Twin Cities and Lake Minnetonka, Minnesota licensed remodeling contractor. 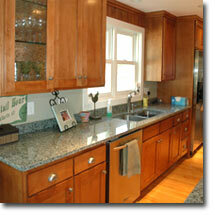 Twenty years experience in residential remodeling, commercial remodeling and new construction. Licensed, Bonded, Insured Independent contractor.